The latest update for the Tunemark Radio iPhone app is now available on iTunes. 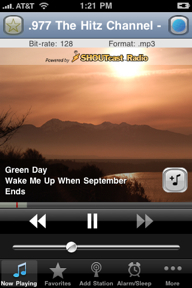 Tunemark Radio is a free iPhone radio player which provides access to the complete Shoutcast stream (over 30,000 stations!) as well as support for entering a custom pls, m3u, or direct URL for any radio station for which you may have a link. It also includes support for “tunemarking” the current playing song. This allows you to save the song artist and title to list for future reference, email it to a friend, or search for it on iTunes for purchase. 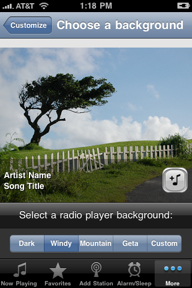 This newest version has a slightly improved design for the user interface, including added support for customizing the background wallpaper image which is displayed while listening to the music. You are also able to select an image from your photo library and use that as the background wallpaper. More enhancements are in the works, so please stay tuned for future updates.